The average organization spends up to 10% of its annual budget on T&E, making it one of the largest controllable areas of discretionary spending. Combined with the fact that up to 90% of employee expenses are incurred on business trips each year, this means accurate expense management is more important than ever. Yet many organizations still rely on manual processes and paper-based tracking that can create serious expense management challenges for their finance teams: how can they control costs when they lack visibility into spending? Yet how can they increase visibility and control without sacrificing employee trust and empowerment? The trick is balancing these issues in a way that that works best for them. 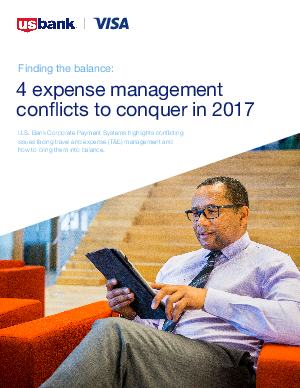 Get the report to see how leading organizations are finding their balance and streamlining expense management to cut costs, empower employees and meet their unique needs today and into the future.